Whatever you think of crossovers, I’m here to tell you that some are sporty, some are fun to drive, and a few combine that with luxury befitting a fine sedan. 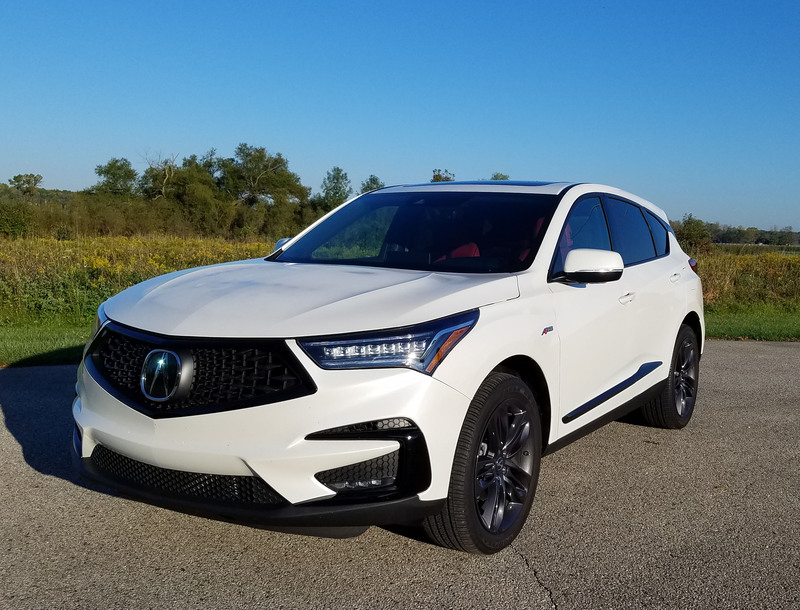 Acura’s RDX AWD A-Spec, newly restyled for 2019, is one of the above. It’s a rip-roaring good time that handles like a sport sedan and rides like a luxury car, when in its Comfort drive mode. And for those who prefer even more oomph and a stiffer ride, there’s Sport mode. And if you want your spine tingled, then try Sport+. For those who prefer their excitement off pavement, there’s an Off-Road setting too. 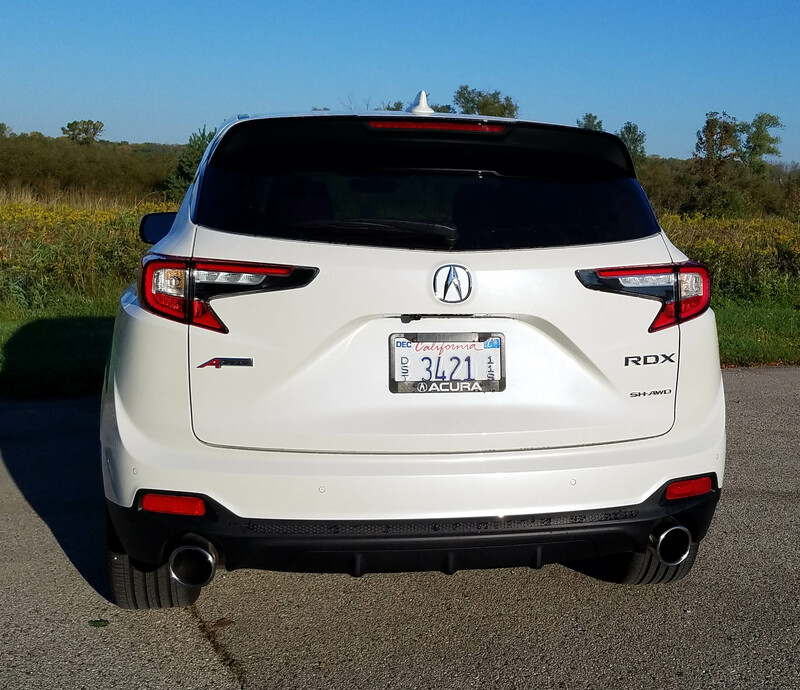 If you’re so inclined the RDX has 8.2-inches of ground clearance. But back to the power. Acura drops in a turbocharged VTEC 2.0-liter four-cylinder that spins out 272 horsepower and 280 ft.-lbs. of torque. It jumps to full life quickly and even growls enough to help you imagine having at least a V6 under the hood. Wanna get away from the stoplight quickly or blast past that dawdler on the highway? This will do that. A slick 10-speed automatic gets that power to all the wheels when needed and smoothly. 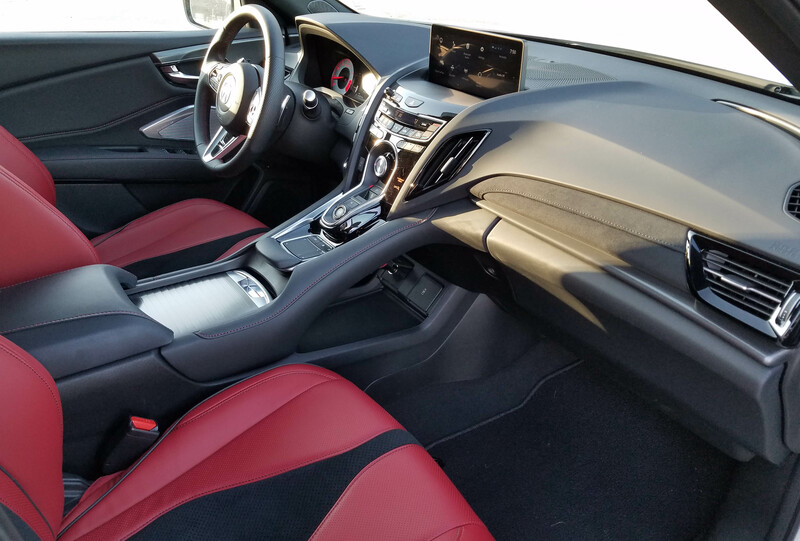 This A-Spec model also comes with Acura’s Super Handling all-wheel-drive system designed to not only give the vehicle grip, but also aid handling when you carry that speed into corners. Electronics are a wonderful thing … mostly! So you can corner well here and easily maneuver in traffic. The electric power steering is well weighted. However, tight turns in a parking lot are a bit more of a challenge as the turning radius does not seem as nimble as many others, including the Volvo XC40 I had the week prior, and the giant Ford Expedition, the week after. Ride also is luxurious and well controlled in Comfort mode, but not so much in the others. For normal city and highway driving you’ll want to leave the mode button alone, mostly. Braking from 12.4-inch vented discs in front and 12.2-inch solid rear discs will whoa this baby down in a hurry. All the usual safety devices are here too, including blind-spot warning, front and rear parking sensors and rear cross traffic alert, all part of Acura’s Tech package that’s standard on the A-Spec model. 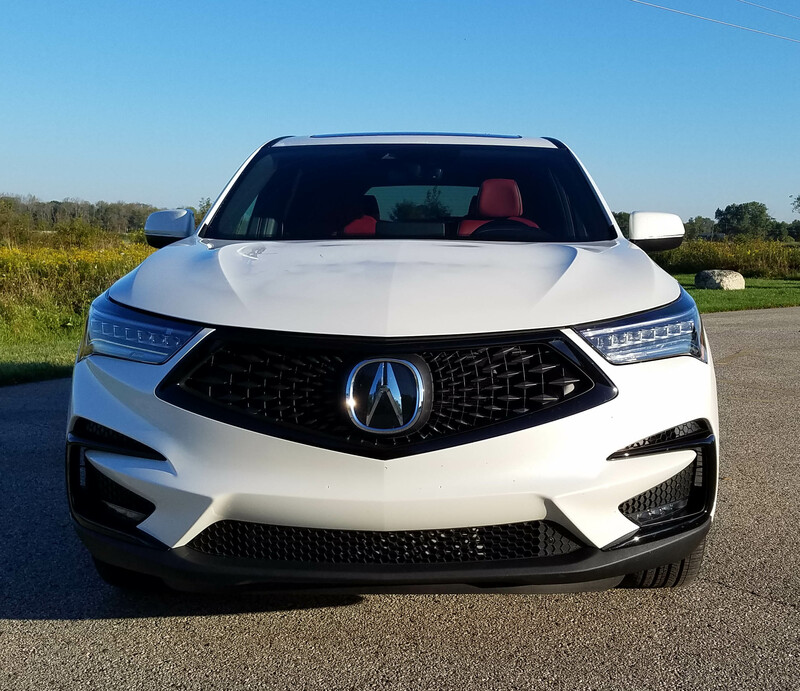 In addition, Acura includes lane departure warning, road departure mitigation (helps pull the car back the lane’s center), collision warning and mitigation braking, and smart cruise control. Inside the bright white test vehicle the interior was bathed in black and red leather. The dash and doors are black and the seats red with black velour in their center. 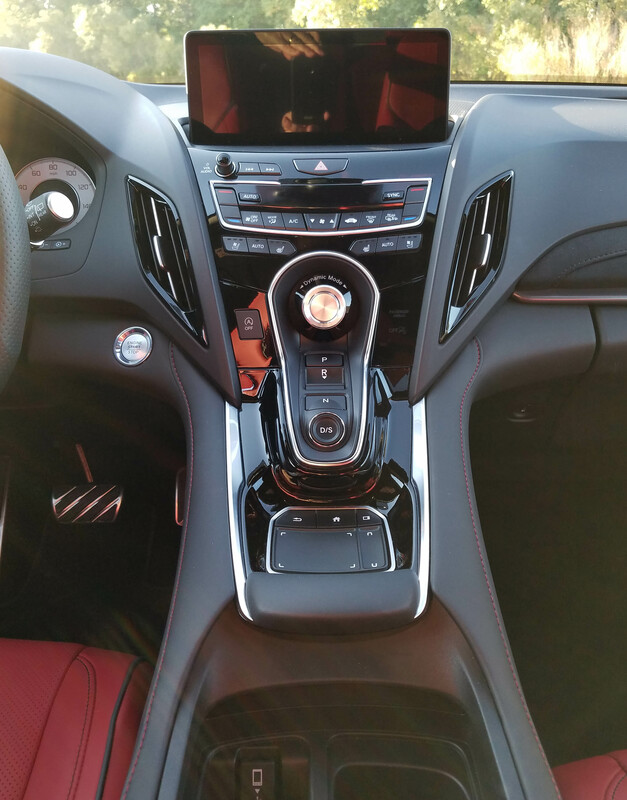 The steering wheel and doors are black leather with red stitching and there’s black gloss trim around the air vents and satin chrome on the steering wheel hub, door release levers and around the center stack controls. At night there’s a nice diffuse red light on those door handles too. Seats are comfortable and well contoured with good hip and kidney support and the driver’s seat has two memory settings. Naturally everything is power adjusted up front and those seats are automatically cooled and heated. Nice when we have warm fall days where the car is cooking when you get inside, but in the morning it’s only 40-50 degrees and the leather seats are chilly. This worked well. The tilt/telescope wheel was manual, a bit of a surprise in a luxury vehicle, but easy to adjust with the usual accouterment of buttons on the hub. Overhead is a panoramic sunroof and the dash has a good-sized screen and superb ELS Studio 3D sound system. 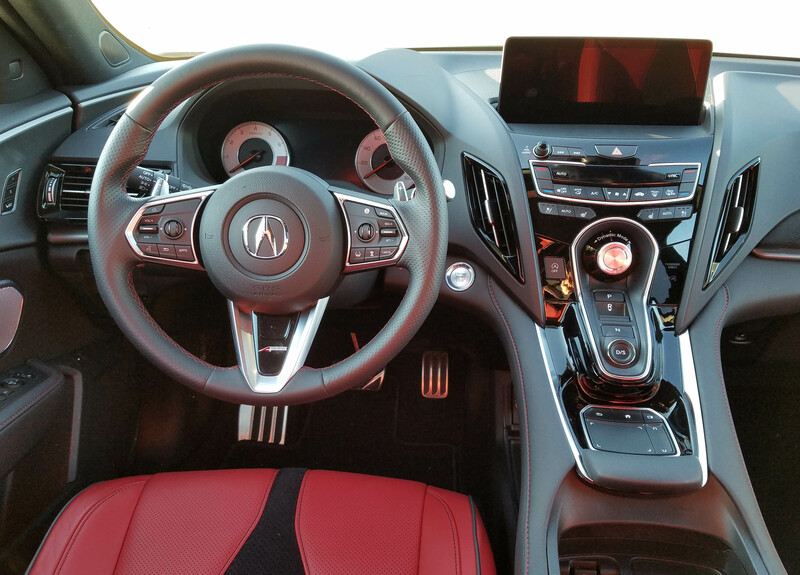 The center console and stack are a bit overwhelming to look at and includes Acura’s fancy-schmancy new touch pad that operates the functions on the screen. No touchscreen here, just this pad. The pad itself works easily enough in that you touch a spot on the pad that sort of corresponds to the eight main icons on the home screen. Usually I got what I wanted within the first couple tries. The funky center console and touch pad. The problem is that you must look at the touchpad to find the spot you want to touch and then dialing in the map for navigation, or finding and saving radio stations takes a few more pad touches to get what you want. It’s both time consuming and frustrating if you’re trying to do this while driving. Don’t! Adjust everything when you’re sitting in the driveway or parking lot. While I applaud all the automakers for trying to find new and simpler ways of adjusting a radio (the touchscreen is about the only thing that really is as good or better than past dash buttons), I feel these developments are sometimes a solution to a problem that didn’t exist. It was always easy to program six dash buttons for the radio and then press them as you were driving without anything more than a quick glance to make sure you were hitting the right button. A few car makers have gone back to this, or design their touchscreens to look more like this old-timey solution. More need to! There’s a dual climate control system too and in the radio’s defense there are backward and forward search buttons next to the screen. Shifting is handled via several buttons on the console, which oddly juts out from mid-dash down to the ubiquitous cargo container/armrest between the seats. While that makes it easier to reach, there’s a big open area below it. That could be good for storage, but it’s hard to access while in the car and you tend to forget things as they appear hidden below that floating console bridge. Back seats are comfortable and spacious and there’s good storage room behind the rear seats, which will split and fold flat. The hatch is powered too and there’s decent storage room below the cargo floor. Overhead the visors slide, but the big A-pillars on each side create some side to front vision issues, a common theme with sport-utes and larger crossovers. Subaru is one firm that has figured this out and design in thinner A-pillars for better visibility. Gas mileage was disappointing, a full 4 mpg lower than last week’s Volvo XC40’s EPA ratings and 2 mpg less in real world driving. I got just 22.1 miles per gallon in a week’s drive in the Acura, about 60% city and suburban driving. The EPA rates this at 21 mpg city and 26 mpg highway. Pricing? 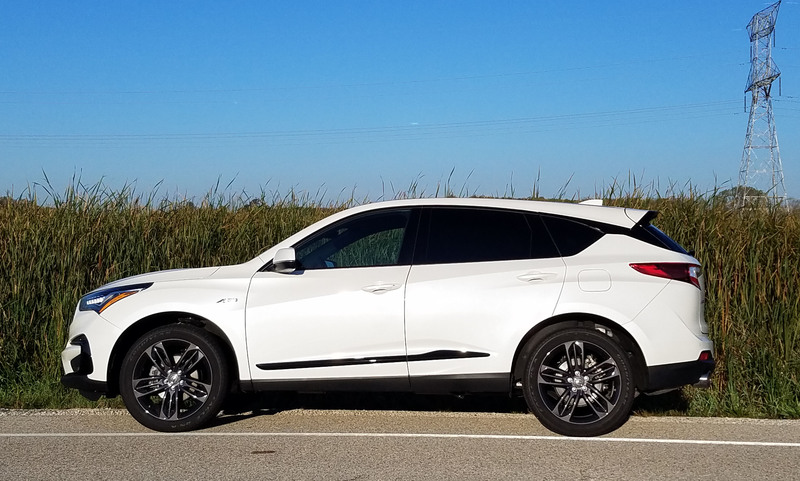 Well, the RDX starts about $37,300 and moves up about $1,000 in any trim level if you add SH-AWD. 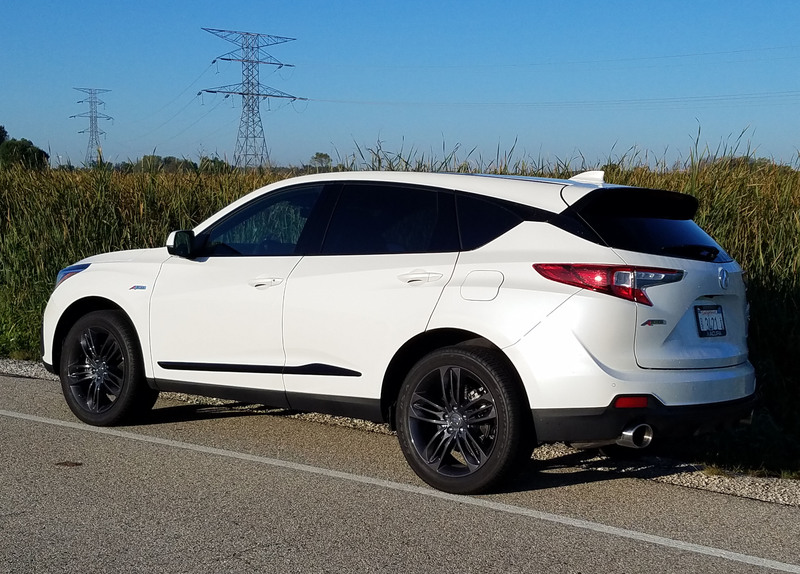 The RDX with just the Tech package lists at $41,495 with delivery, while the tested A-Spec lists at $44,495. This one was $45,500 due to the AWD. Go all the way to the top level Advanced package and the Acura starts at $47,400 with AWD. This one added no options so stayed at $46,495, right about the price of the Volvo and about a dozen other entry-level luxury crossovers of equal luxuriousness, but most aren’t as gutsy. Hits: Rip-roaring power, responsive handling, good ride in comfort mode. Four drive modes, automatic heated/cooled front seats, big sunroof, ELS Studio 3D sound system and full array of safety devices. Misses: Frustrating touch pad on console to adjust screen functions, big A-pillars, odd open storage area under console bridge.